Trump has been inflating the size of his crowds since his early days as a candidate. His presidency began with a surreal national debate over how many people attended his inauguration. And this year, at midterm campaign rallies across the country, the president’s crowd-size boasts became a big bugaboo for fact-checkers. There’s no question Trump can draw supporters by the thousands, but his pumped-up numbers are so extravagant most of the time that they have little or no basis in fact. For example, Trump claimed 50,000 people were outside a rally in Houston because they couldn’t get in, but the city’s police chief said the number was much lower: 3,000. In Cleveland, Trump claimed “thousands” of people were outside because the venue was packed. But Twitter users at the event posted evidence that Trump didn’t fill the venue and that only a handful of people were milling around in the parking lot. In Tampa, Trump claimed thousands of people who couldn’t get in were watching outside on a “tremendous movie screen” — that didn’t exist. It’s a mystery how Trump comes up with these estimates and details about his rallies. His campaign didn’t get back to us. But in almost every instance, the president’s numbers don’t add up or are contradicted by reporters or local officials. We reconstructed as much as we could and compared Trump’s estimates of his crowd sizes this year with information from local media, law enforcement or attendees posting photos and videos on Twitter. Trump has held 44 rallies this year, but we focused only on 19 for which he gave some kind of estimate of the crowd size. Trump held this event at Total Sports Park, which was packed with an estimated 5,000 to 6,000 people. So the president’s claim here is that 25,000 to 36,000 people may have been rallying outside. According to a local news report, approximately 30,000 people were expected to attend this Trump rally. But we couldn’t find evidence that this prediction turned out to be accurate. Local news reports estimated only that “thousands” attended. Photos taken by local media and video from CNN suggest that the crowd outside the event was much smaller than 25,000. A Twitter user inside the venue for the rally estimated that there were “at least twice as many” people watching outside on a big screen. It’s unclear how he landed on that number, but if it’s accurate, it would represent fewer than half the people Trump estimated. Without any hard evidence to support Trump’s claim, it’s a bit absurd to imagine 30,000 people or so squinting at a Jumbotron while the president addressed a much smaller crowd of 5,000 to 6,000 inside the venue. Local officials estimated attendance at 5,500. This rally was held at Amsoil Arena, which can seat more than 9,000. According to a local news report, an arena official said 8,372 people attended Trump’s rally and many others were turned away at the door. There’s nothing to indicate they hung around outside. This venue, Scheels Arena, seats up to 6,000. Trump suggested with no evidence that three times as many people were outside. It appears that 20,000 people signed up for tickets to this Trump rally, but that doesn’t mean 20,000 people were outside. About 300 to 400 people outside were protesters, according to a local news report. That report also said Trump supporters who couldn’t get into the rally were told by the Secret Service and local officials to “disperse” and go watch it on TV. “Many sat outside the arena watching Trump speak on their phones,” the West Fargo Pioneer reported. “Thousands and thousands” appears to be a huge stretch. The county sheriff estimated that 8,000 people had lined up for this rally, according to a local news report. The Four Seasons Arena holds 6,600, and Cascade County, which owns the venue, estimated attendance of more than 6,500. Kudos to the Tampa Bay Times for running down this false claim in real time. The newspaper reported that “hundreds” of people were outside this Trump rally, not “thousands and thousands.” And some of them were protesters. And there was no “tremendous movie screen” anywhere in sight. A capacity crowd of nearly 11,000 filled the Ford Center for Trump’s rally. There were an estimated 1,000 protesters outside, plus “a small group of Trump supporters,” according to the Courier and Press. No sign of screens. This venue, JQH Arena, holds 11,000. There’s no evidence that people hovered around if they couldn’t get in or that TV screens were mounted outside. We have no clue how 20,000 in Hawley’s estimation became 45,000 in Trump’s. In any case, both numbers seem to be seriously inflated. A police spokeswoman told the News-Leader that 12,000 people showed up. That suggests 1,000 people were turned away if the venue was at capacity. A city official told the newspaper that 2,000 people were turned away. “For context, Trump’s claim that 44,000 people were outside the Springfield rally would mean a crowd that’s equivalent to more than a quarter of Springfield’s total population. 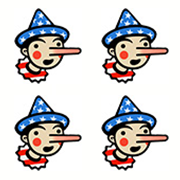 The U.S. Census Bureau estimates that about 167,000 live in the city of Springfield,” the News-Leader reported in a fact check of Trump’s claim. Freedom Hall, where Trump held this rally, holds 8,000 to 8,500. The director of the center told the Johnson City Press that 6,500 people were allowed in, 1,000 were sent into an overflow room with large screens, and between 1,500 and 2,000 were outside watching large screens. That’s 18,000 to 18,500 fewer people outside than Trump claimed. A capacity crowd of nearly 10,000 filled this venue, “with 1,000 to 2,000 more watching on giant screens outside, according to city officials,” the Star-Tribune reported. Also, “hundreds marched nearby in protest of Trump’s visit.” This was a convention center, not, as Trump claimed, a stadium. Police estimated 3,000 people outside a 9,000-seat venue in Erie on Oct. 10, according to the Times-News. This event drew an estimated 6,100 inside the venue and a “large crowd” in the parking lot. A photo posted on Twitter by a local news reporter shows this crowd facing a movie screen. But there’s no indication this crowd was bigger than 1,000 or 2,000 people at most. In addition, “hundreds” of people outside were there to protest Trump, according to the Herald-Leader. The Washington Post’s Jenna Johnson was at this event and noted that most people who were in line and turned away at the door decided to leave rather than stand outside in 47-degree weather. According to the Houston police chief, Art Acevedo, 18,000 to 19,000 were in the venue for Trump’s rally and 3,000 watched on a big screen outside. “The arena seats 18,000. Many hundreds of seats were empty, including all of the boxes on both tiers of the mezzanine,” the Dallas Morning News reported. So, according to the paper, the president didn’t fill the venue, and according to the police, the crowd outside was a paltry 6 percent of Trump’s grandiose estimate of 50,000. Trump’s campaign claimed 109,000 people registered for tickets to this Houston rally. Again, though, this is not a measure of the actual crowd size. Anyone could go online and register for two free tickets. A local CBS affiliate reported that 4,000 people were inside, while an overflow crowd was outside the hangar. A Republican state lawmaker from Illinois was quoted as saying that 8,500 people in total went through metal detectors. That uncorroborated claim seems to support Trump’s line that “a group almost as big” as the 4,000 attendees inside the hangar was outside. A reporter for the Naples Daily News was outside the venue while Trump was speaking. He took video of the crowd. It was paltry. This one is outrageous. Trump says he filled airport hangars — not one but two! — during a rally with Republican gubernatorial candidate Brian Kemp in Georgia. But there was only one hangar. The crowd at this event was divided in three: the people inside, the people just outside the open hangar, and a third group watching a TV screen on a different part of the premises, sandwiched between the airport and a corporate office. Kemp’s campaign estimated that 10,000 people attended in total, and the Bibb County Sheriff’s Office estimated 12,500 inside and nearly 6,000 outside, according to a fact-check by WMAZ. The overflow crowd sandwiched between the airport and the corporate office numbered in the “hundreds,” according to Atlanta magazine. The most generous tally, 18,500, is a far cry from the 55,000 Trump claimed. Twitter users at this event found that the crowd did not fill the venue. I went to the Trump rally in Cleveland today for a work project. While Trump was speaking, four people were in front of a TV screen set up outside the venue, according to a photo taken by a Twitter user at the event. Reporters at this event found no people waiting outside. "Outside is even more incredible," Trump says in Fort Wayne, claiming that "thousands and thousands of people" were outside the venue. These relentless, fantastical boasts show a deep schism between the president’s self-image and reality. Let’s leave out all the instances in which Trump said “thousands and thousands” and focus only on the rallies for which he gave hard numbers or indicated rough totals. At nine such rallies this year, the president’s estimates came to 352,600 people combined. Our review of official counts and news reports shows the number was much lower: 100,972. That means Trump multiplied his crowd sizes by a factor of 3.5, at minimum. Of course, this doesn’t take into account all the times he made wild assertions about his crowd sizes without giving hard numbers. These claims deserve Four Pinocchios. Or, if you prefer to use Trump’s math, “thousands and thousands” of Pinocchios. “The crowds at my Rallies are far bigger than they have ever been before, including the 2016 election. Never an empty seat in these large venues, many thousands of people watching screens outside."